One can hardly imagine a more difficult time to be a Quaker, completely against war, than in 1777, in the midst of the American Revolution. Yet in fact, Quakers were an important part of American history at that time, creating peaceful relations with the Native American community, and refusing to take sides in the revolution. 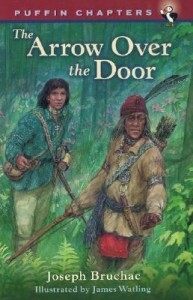 This very informed historical fiction children’s book depicts an actual event involving the Quakers in New York State, and their encounter with French Canadian Indians. The story is told through the eyes of two young boys, a Quaker, and a member of the visiting tribe. The entire episode unfolds with grace and lovely details. As I read this children’s book, I felt as if I were truly transported back in time, witnessing the events as they unfolded. At the end of the book are the substantial historical records about what happened. I think this is an important historical fiction children’s book for schools, as well as children. I certainly hope my grandson gets to read it. The point that the book makes about war, peace, and friendship is so important today. How fabulous that the point can be made through a factual event, retold for children. A great classroom read.